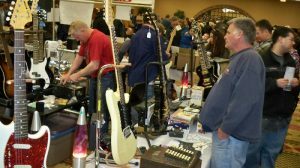 Some of the action at a previous Vintage Voltage Expo! 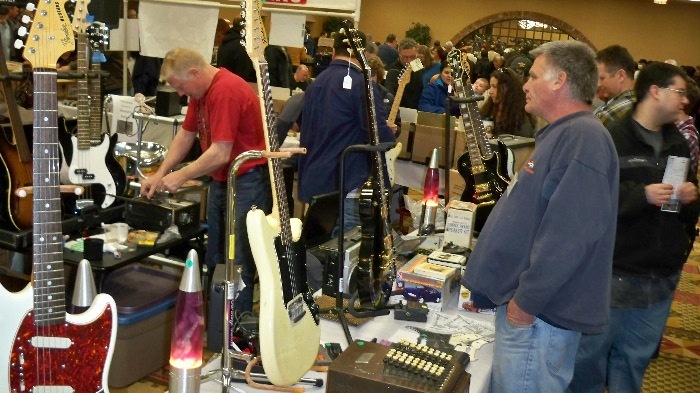 Dear friends and fans of vintage audio, radio, music gear and electronics: This show gets over 1,200 shoppers each year – and this year we’re expecting that number to DOUBLE! This will be the ONLY Vintage Voltage Expo in 2019. The Ramada is remodeling, so we are moving to a bigger, more central location! The Denver Mart, I-15 at 58th Avenue (exit east). Lots of parking! Because the Mart is so BIG, we are doing 2 shows at once – splitting the Expo Hall down the middle! Each $5 admission ticket now gets attendees into the Vintage Votlage Expo … and the Toy & Doll Supershow! Loads of Vendors from around the region selling: vintage electronics: old school audio gear ● tube amps ● antique radios ● transistor radios ● speakers ● turntables ● vintage LPs & 45s ● hi-fi ● synthesizers ● stereos ● 8-tracks ● electric guitars ● amps ● vintage TVs ● ham radio ● commercial equipment ● video games ● parts ● and MORE! More info is on our NEW website! See photos and video from past shows! General show info follows. See you soon! Who: Kids under 12 Free | CRC members FREE. Admission ticket also gets you into the Toy & Doll Supershow! Same location, same time!